"What a ridiculously simple yet profound plan for achieving what Nilson purports. Imagine, students demonstrating mastery of skill for a grade! Students taking back ownership of their progress! Students becoming our clients rather than our customers! Specs Grading, get ready to sashay in and partner up with the outcomes that grades should really reflect." "This book will change your life! Every instructor should buy it now. Nilson shows us how to make grading easier, more logical, and more consonant with research on learning and motivation. A practical, time-saving, student-motivating system of grading. A major advance in our thinking about how we grade and how students learn." 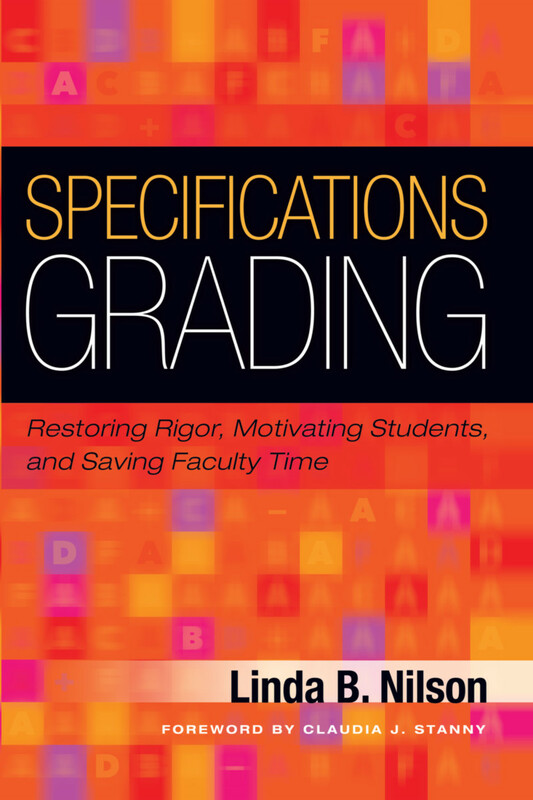 “Faculty who struggle with the challenges of managing time for grading student work and collecting meaningful assessment data from assignments and projects embedded in their courses will find much to interest them in Specifications Grading. Nilson proposes a new approach to rubrics that simplifies the task of grading, maintains standards for consistency and validity of assessments, and aligns grades with specific learning outcomes. Specifications grading addresses a question that has long puzzled faculty: Why aren’t the grades earned by students accepted as assessments of student learning? "Time is precious, and achieving high academic standards is essential for our students. Linda Nilson has given us a thorough review of grading practices and created spec grading, which holds promise both for saving some time for faculty and students and for elevating our standards for student learning outcomes. Brava!" “Her latest book, Specifications Grading: Restoring Rigor, Motivating Students, and Saving Faculty Time, is maybe the most innovative, provocative, and potentially revolutionary one she’s done. Linda B. Nilson now retired, directed three faculty development centers at major research universities during her 28-year career. She also authored several books: Teaching at Its Best: A Research-Based Resource for College Instructors (2016), now in its fourth edition, The Graphic Syllabus and the Outcomes Map: Communicating Your Course (2007), Creating Self-Regulated Learners: Strategies to Strengthen Students’ Self-Awareness and Learning Skills (2013), Specifications Grading: Restoring Rigor, Motivating Students, and Saving Faculty Time (2015), and, with Ludwika A. Goodson, Online Teaching at Its Best (2017). She has given over 450 keynotes, webinars, and workshops at conferences, colleges, and universities nationally and internationally. After receiving her Ph.D. from the University of Wisconsin-Madison, she was a sociology professor at UCLA.